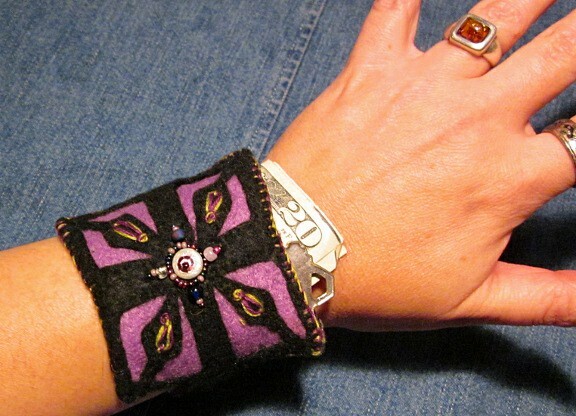 “diamond” wristicuff showing secret stash pocket! Hey all! I will be vending my art prints, greeting cards, and NEW jewelry/accessories/ornaments at Splendorporium’s Splendorcraft Gift Sale, Friday Dec. 6 from 5-9pm, and Saturday Dec. 7th from noon-9pm. It’s at 3421 SE 21st Ave. here in Portland. This gallery is an extension of the Art4Life non profit that benefits public schools in Portland. Come show some local PDX love! You can get more details about Splendorporium here. This entry was posted on November 25, 2013 by laughingnewborn. It was filed under Uncategorized and was tagged with felt jewelry, fiber art, gift sale, mixed media art, Portland.